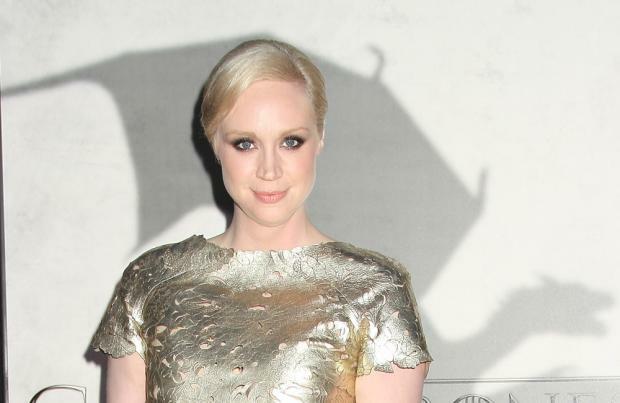 Gwendoline Christie was very excited when she realised her costume in 'Star Wars: The Force Awakens' was gender neutral. The 'Game of Thrones' star plays Captain Phasma, an officer in the First Order, and when she was first presented with her chrome Stormtrooper armour she was delighted to see it had no differences to the other outfits based on her being a woman. In an interview with Vulture, she said: "What I found interesting about the costume. It's armour, and it's entirely functional, and it isn't sexualised in any way. I remember when I first saw it, I said, 'Wow' - not just because it looks incredible, although come on - but because I thought, 'This is new.' I mean, in my own small bubble, this represents the way I think and the way I see things, but it's not always the way of the world. So for that evolved thinking to be in a 'Star Wars' movie, I think people love that! People have responded so well to that. "It's fresh and I also think it's representative of our society. I would imagine that audiences are 50 per cent women, so why not utilise that?" Co-writer Lawrence Kasdan recently revealed that he and director-and-writer J. J. Abrams had originally written Captain Phasma as a man but changed their minds during the casting process. Christie claims she had no knowledge of the gender swap for the villainous character but has a lot of respect for both Kasdan and Abrams for making that call at the last minute. She said: "I think that's great of them, don't you? That there was a discussion about that, and an evolution." Musing of the significance of Captain Phasma being encased in gender neutral armour, the 37-year-old actress added: "It's that we're so used to relating to female characters primarily through how they have been made in flesh and with Captain Phasma, our initial relationship is based on her character and her actions, rather than that random group of elements that comes together and makes us be born in a certain way."